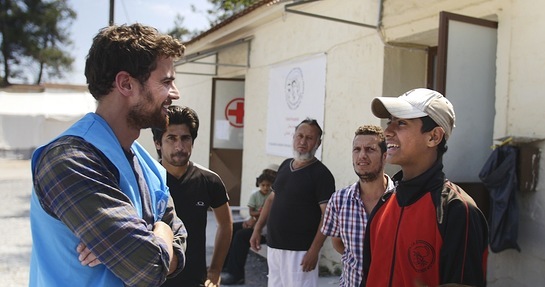 This week actor Theo James travelled to Greece on his first visit with UNHCR ahead of World Refugee Day. Theo has a very personal story that connects him to the refugee situation. His grandfather, Dr. Nicholas Taptiklis, fled Greece during the Second World War, making his way by boat and then overland through Turkey to Damascus, Syria. Immediately after the Second World War ended, Dr. Taptiklis worked in Gottingen, Germany with the organisation that was the precursor to the UN Refugee Agency, fighting typhoid and tuberculosis in the refugee camps. Theo was in Greece to learn more about the work of UNHCR and the situation for refugees. He met with refugee families in sites in Northern Greece (Alexandreia and Lagadikia), as well as in the port of Piraeus and in the Marathon area of Attica. He also met with local authorities assisting refugees. There are currently over 57,000 refugees remaining in Greece following the EU Turkey statement and border closures. Theo said, "The mission with UNHCR felt deeply personal but more importantly it was eye-opening. We are all aware of how complex and politically charged the refugee crisis is. But to meet these families, these fathers and mothers struggling in the midst of one of the greatest humanitarian crises since the Second World War, was beyond anything I had expected. These are people like you and me fleeing their country out of total necessity. On World Refugee Day, held every year on June 20th, UNHCR commemorates the strength, courage and perseverance of millions of refugees. This year, World Refugee Day also marks a key moment for the public to show support for families forced to flee. By signing the #WithRefugees petition, people from across the globe can call on governments to work together and do their fair share for refugees. To sign the petition, click here.